Physical characteristics: The great cormorant is the largest of all thirty-six species of cormorants. Its average length is about 37 inches (93 centimeters) and it weighs as much as 8 pounds (3.6 kilograms). 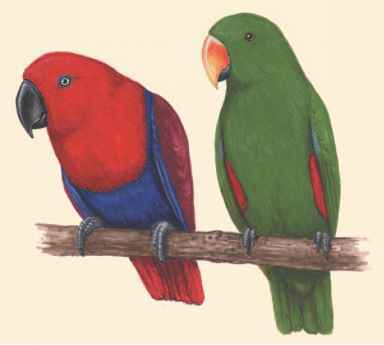 Male and female birds look alike. Adult birds have glossy black feathers and a yellow throat pouch. In breeding season, the adults grow some white feathers on their necks and at the top of their legs. 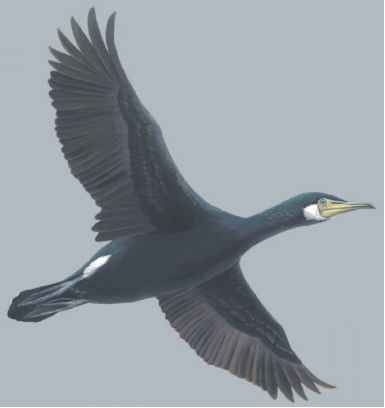 Geographic range: Great cormorants are the most widely spread of all cormorant species. 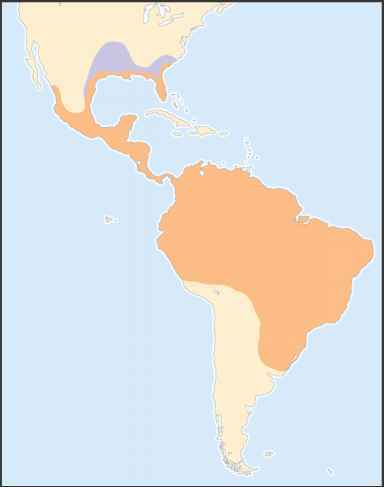 They are found on the east coast of North America, and in temperate areas in Africa, Asia, and Australia where the climate is moderate or cool. They usually spend the winter near their breeding places. Habitat: In North America, great cormorants nest mostly along the shore of the Atlantic Ocean and feed in coastal waters. But in other parts of the world, they are also an inland bird. They breed in many kinds of wetlands, including marshes and mangrove swamps, lakes, rivers, and reservoirs. Diet: Great cormorants eat mostly small fish, but they occasionally catch other water creatures such as crayfish, squid, frogs, salamanders, snakes, and insects. They catch most of their prey underwater. A cormorant usually swims along the surface and dips its head in and out of the water, looking for prey. If it spots something to eat, it dives in with its wings held firmly against its body. It pushes itself along with its webbed feet, and its heavy feathers help it sink down quickly. When the bird grabs a fish, it swims to the surface and swallows it headfirst. Later, it will regurgitate (spit up) the bones and scales. It leaves the water as soon as it has finished eating. Behavior and reproduction: Cormorant feathers are not fully waterproof and become very heavy when wet. Colonies of cormorants can often be seen standing around with their wings spread as they dry their feathers. Great cormorants nest in colonies on rocky cliffs along seacoasts or in trees near lakes and rivers. The male chooses the site and waves his wings. When a female approaches, the birds greet each other with courtship displays. The male brings nesting materials to the female, and she builds a big nest. She lays three or four eggs, and the adults both sit on them and care for the chicks. By the time the young birds are eight weeks old, they can fly as well as adults and take care of themselves. Great cormorants and people: In most places, they are not of great importance to humans. In Asia, some great cormorants are trained to help people catch fish.